A tangible evidence of all this? fragrance and taste … unique! What is the magic spell? What is the secret to a good natural leavening? It’s just time! It takes over 48 hours to bake all of our specialties. The production process specially designed for Londi is structured in two phases focused on natural leavening. The dough is left to rest for several hours in a controlled environment so that the yeast, in an absolutely natural way, can “do its job” of fermentation and inflaming the dough. In the second step, the products are allowed to leaven throughout the night before being coocked. This is why all Londi products taste so good. It is the good of natural leavening! Tutti i giorni negli stabilimenti livornesi della Londi vengono sfornate migliaia di brioche, danesini e focacce, che, velocemente, trovano la loro strada sulla tavola del consumatore, fragranti e freschi come appena sfornati. La fragranza dei prodotti è garantita in primo luogo dalle confezioni, studiate specificatamente per salvaguardare la loro freschezza. Prova a riscaldare una brioche Londi: esalterai ancora di più la sua fragranza e sentirai il vero profumo di una brioche appena sfornata! La freschezza dei prodotti Londi ti permette tutte le mattine di fare colazione a casa tua con una brioche “fresca” come al bar. Il sistema di distribuzione di Londi è stato sviluppato in modo efficace per raggiungere, il più velocemente possibile, i punti vendita. Quality is for Londi a matter of "heart"
Artisan quality is not just an idea or an empty phrase, but a reality, which is guaranteed by carefull Checks and Certifications. 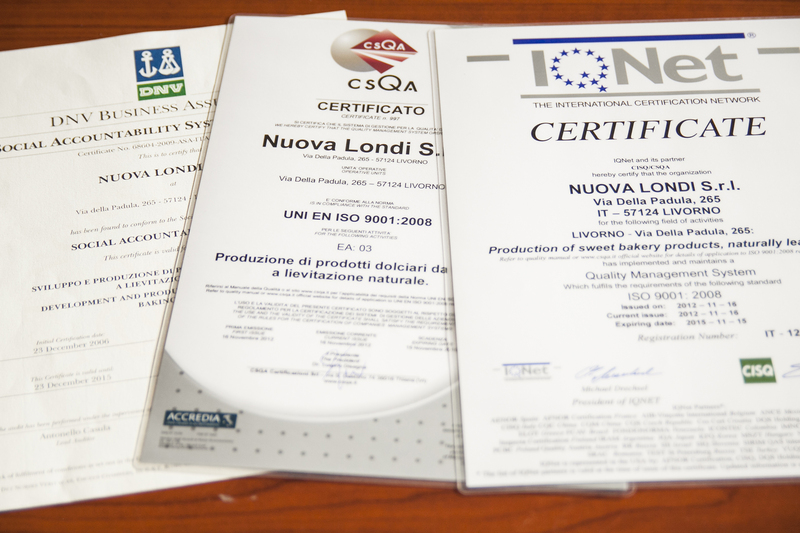 The Londi quality system is today certified UNI EN ISO 9001: 2000, which is an international standard that defines the criteria and the procedures to ensure quality in the production process. The adherence to these standars is volountary, but Londi considers it a necessary step in the company’s path of continuous development. Indeed Londi felt it necessary to equip itself with the SA8000 Ethical Certification System. With Ethics Certification, the Management wants to highlight the values that have always been followed and that are considered fundamental: security, satisfaction and motivation of its human capital who is committed to the company. 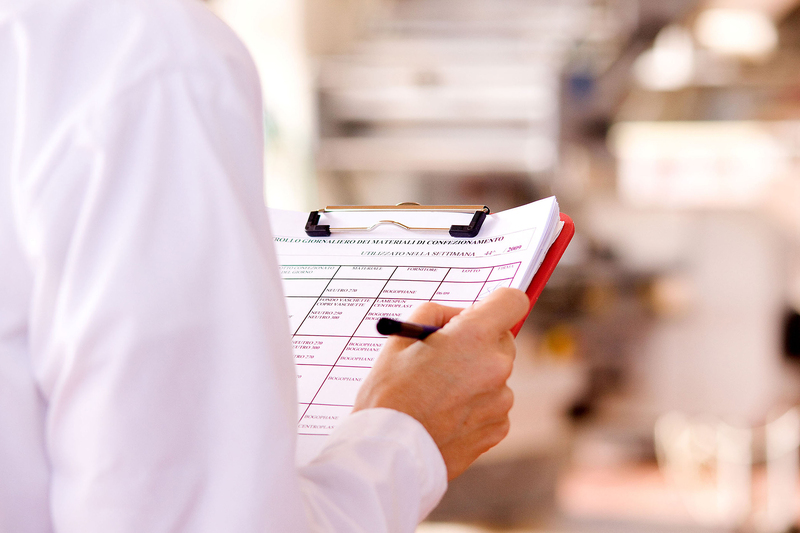 The entire production process, from the beginning to the end, is kept under constant control, beginning with the choice of raw materials to the freshly made, baked and packaged product, all in compliance with the Hazard Analysis and Critical Control Point (HACCP) rules and standards. Artisan quality also means respect for health as a primary value. Londi always points to the naturalness and genuineness of raw materials; in fact it does not use GMOs and guarantees that its products are prepared with natural and strictly selected ingredients.